It’s that time again, time for a Secret Recipe Club reveal! This month I was assigned Itzy’s Kitchen, written by Erica, mom to the most adorable baby girl, Kaylin, and an English Bulldog named Frank. My pal Maegan would be so in love with Frank! It didn’t take me long to settle on a recipe. With a title like Waffles of Insane Greatness, how could I not?! Make sure you also check out Erica’s recipes for German Potato Salad (a family favorite when I was growing up), Ghirardelli Sea Salt Double Chocolate Cookies and this Fancy Schmancy Citrus Tart. All are now on my list of must makes! You may have noticed my waffles aren’t your typical Belgian squares with deep wells for syrup holding. You may or may not have caught on by now that I’m a bit of a Disney fanatic. After a semester working there, and a lifetime of visiting, it’s fair to say I have a bit of an obsession. I don’t let it take over the house though. You’ll find little spots throughout our house with a touch of Disney magic. Like this waffle iron. I can’t tell you how happy it made my Sunday morning to have Mickey staring up at me from my plate. After reading Erica’s recipe, I knew that this recipe would be the perfect application for the pot of apple cinnamon Chobani Greek yogurt in the fridge. The little chunks of apple were a pleasant surprise throughout the waffles. James couldn’t get enough of them! If I had anything to do differently, it would have been to add some toasted walnuts or pecans to the batter. My dad used to make walnut and pecan waffles all the time for us when I was a kid, and they’re still my favorite to this day. I wasn’t too sure how James would take to them though, so I left them out this time around. You could use any flavor of Greek Yogurt as inspiration here. I’m pretty sure Black Cherry or Pomegranate would also be mind-blowing. Think of all the possibilities for a Mother’s Day breakfast in bed to remember! 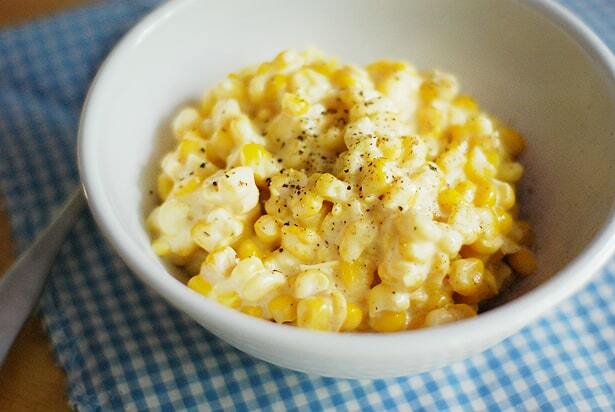 Thanks, Erica, for a fabulous recipe. We’ll be making these waffles all the time! In a large bowl, combine flour, cornstarch, baking powder, baking soda, and cinnamon. Whisk together to combine and aerate. Add the milk, yogurt, oil, egg, sugar, and vanilla extract directly to the flour mixture. Mix again with the whisk until all the ingredients are thoroughly mixed and incorporated, and you have a smooth batter. Cover the bowl with plastic wrap for 30 minutes. After 20 minutes, heat your waffle iron. Allowing it to go through its heat cycle a couple of times will ensure crisp waffles. Cute and fun waffles! My boys would love those! I could eat these waffles by the dozens. They are totally kid friendly too. 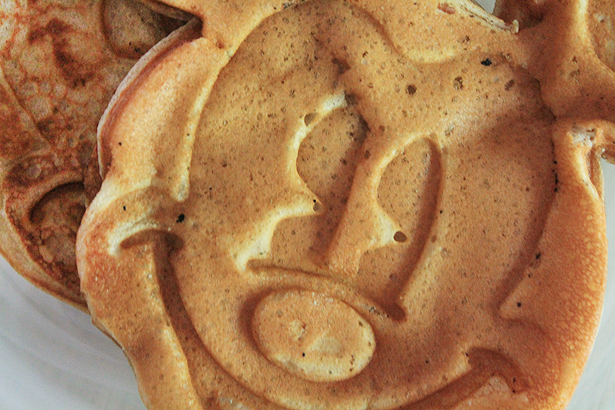 Having Mickey waffles for breakfast would make anyone’s morning brighter. Sounds like a delicious recipe. You bet, Barbara! Thanks so much for taking the time to comment. So cute! I love the Mickey waffles! Sarah, I put cereal on the apple cinnamon a few weeks ago instead of dousing it in milk. Genius move, I have to say. It’s some fabulous yogurt! Those look yummy and cute! I love yogurt in just about anything; why have I never thought of putting it in waffles! I absolutely adore your waffle maker, too…so freaking cute! Thanks, Tracy 🙂 Next time you visit, I will make you these. Guess who is married to a weirdo who refuses to have flavors in his waffles? (raises hand). But I love the idea of yogurt in my waffles, so I guess I’ll be sneaking the plain Chobani into my version. Or maybe the vanilla one? Surely he wouldn’t object to vanilla in his waffles? Love the flavor of these waffles! My SIL works for Disney, so I have a soft spot for Mickey! Erin, where does she work? I’m an Epcot alumni, and I miss it terribly. Best job ever. She is at Animal Kingdom and has been there since it opened. She is a manager with the primates (started with training the primates). Fun place to work! These might just be the cutest waffles ever and the addition of yogurt is pretty genius! My daughter would FLIP over these! Melissa, they’re pretty darn kid friendly. And let’s face it, what kid isn’t going to eat something Mickey shaped? Thanks so much, CJ! So nice of you to comment. Erica, I’m so sorry! I just fixed the post. Would you believe I was so worried about spelling Kaylin’s name right that I checked it 3 times, and somehow forgot to double check I was spelling your name right? Thanks again for a fabulous recipe. What a fun idea to use flavored Greek yogurt, I would have never thought of that! Cutest waffles ever, btw. Thanks, Rachel. I just love that smiley Mickey face.